Your kitty loves real meat, so give him the nutrition he craves with the Nutro Max Adult Lamb & Turkey Cutlets Entree Chunks in Sauce Canned Cat Food. Featuring real lamb and turkey with never any by-products, it provides plenty of quality protein for healthy muscles and the flavor your little carnivore loves. Slow-cooked in savory sauce, every bite is also packed with all the nutrients your pal needs to look and feel his best, like vitamins, minerals and essential taurine, plus omegas for a healthy skin and coat. It also provides plenty of moisture to help keep him hydrated and healthy from nose to tail! Adult wet food recipe features real lamb and turkey in sauce for the protein needed to support healthy, lean muscles. 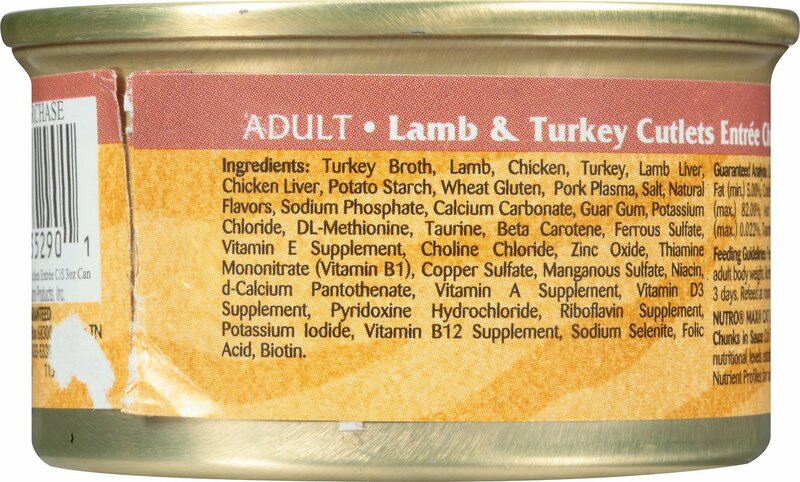 Turkey Broth, Lamb, Chicken, Turkey, Lamb Liver, Chicken Liver, Potato Starch, Wheat Gluten, Pork Plasma, Salt, Natural Flavors, Sodium Phosphate, Calcium Carbonate, Guar Gum, Potassium Chloride, Dl-Methionine, Taurine, Beta Carotene, Ferrous Sulfate, Vitamin E Supplement, Choline Chloride, Zinc Oxide, Thiamine Mononitrate (Vitamin B1), Copper Sulfate, Manganous Sulfate, Niacin, D-Calcium Pantothenate, Vitamin A Supplement, Vitamin D3 Supplement, Pyridoxine Hydrochloride, Riboflavin Supplement, Potassium Iodide, Vitamin B12 Supplement, Sodium Selenite, Folic Acid, Biotin. 5/6 of my kitties love this. The one that does not will not even eat raw or cooked meats. He's a little picky. The other 5 however loved this over other canned foods that I have gotten for them in the past. This will be my go to for canned because of this reason as well as it's got the best ingredients possible compared to other brands. I was very disappointed that my cat did not enjoy this food. I tried it on 3 separate days wondering if he was just in a finicky mood, but it was a no go. As my cat gets older we are moving to a more bland simple diet of lamb. I got this for him as a treat just like the old times, but he got a whiff and wouldn't touch his dish til I washed it. 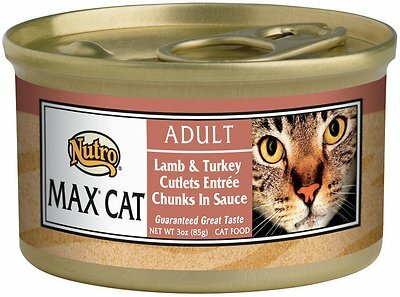 One of my cat Buddy's favorite foods. He loves it. 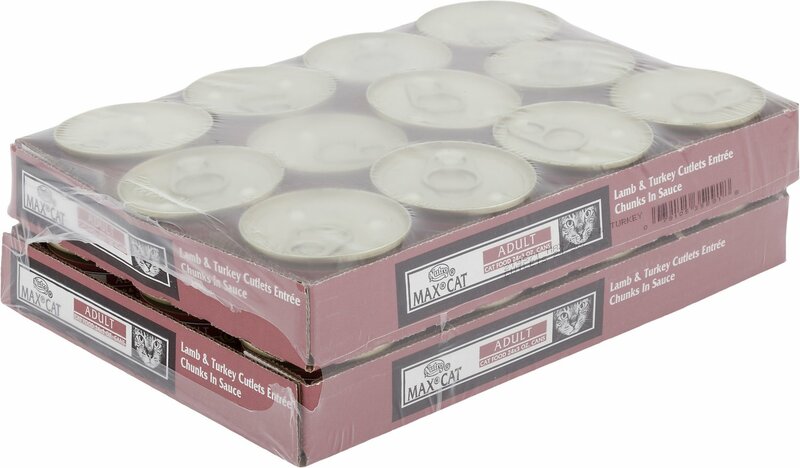 My cat Buddy really likes this flavor of Max Cat. It's one of his favorites. My cats love this food. They are 13 and older and it’s hard to find food for their age. Chewy.com nailed it! I've been buying this flavor/brand for years and my cats still enjoy it. The brood likes the Max Cat chunks. And chewy had them on sale recently for a very good price, so I got several cases!